State Pushkin Museum of Fine Arts, the Stroganov Moscow. To mark 120 years since Varvara Stepanova’s birth the State Pushkin Museum of Fine Arts, the Stroganov Moscow State Academy of Arts and Industry and the Rodchenko and Stepanova Archive present the exhibition “At Home with Rodchenko and Stepanova”. The exhibition focuses on the work of these leading artists of the Russian avant-garde, including their role as teachers. It features more than 250 exhibits: paintings, works on paper, photographs and personal effects from the Rodchenko and Stepanova Archive. Works by their students at VKhUTEMAS give an idea of Rodchenko and Stepanova’s “home” as the territory of a new art. Rodchenko and Stepanova worked together their whole lives, in a single style, and often on the same themes. Rodchenko was the creative leader, the generator of ideas and original methods. Stepanova consolidated these innovations in her own independent way and was an excellent organiser. The exhibition covers the period from c.1910 to the mid-1930s. It allows us to observe the development of the artists’ work from symbolism through abstract-geometrical painting and drawing to constructivism. Rodchenko arrived at constructivism as a result of numerous artistic experiments. For him it was a move from art to design, from abstraction to reality. 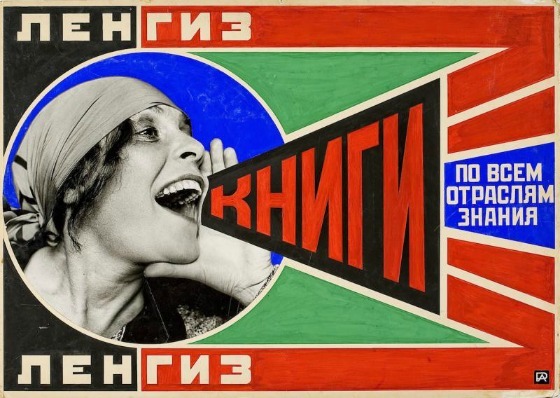 “The future is our only goal” was proclaimed by both Rodchenko and Stepanova. They gave impetus to the development of the main artistic movement of the 20th century, which changed the style of everyday life. Stepanova wrote, “A painting, transformed in to an experiment and scientific data, gives the formula for the production of a new form of life”. 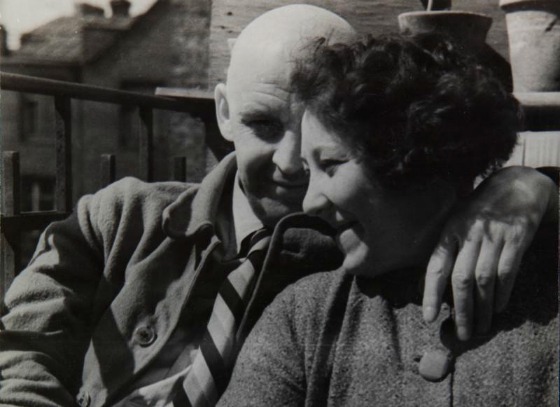 Аt home with Rodchenko and Stepanova. State Pushkin Museum of Fine Arts, the Stroganov Moscow. Rodchenko and Stepanova. State Pushkin Museum of Fine Arts, the Stroganov Moscow. The exhibition comprises nine sections. The studio. The first room recreates the atmosphere in which the artists lived and worked. It shows their home as a workshop of different types and genres of art. Here they prepared canvases, cut wood for stretchers and constructions, drew, cut out cardboard, made book bindings, glued collages, and discussed projects with colleagues and friends. Varvara Stepanova was responsible for business correspondence, negotiations, keeping a diary and collecting and archiving documentation. She often made things, turning sketches and drafts in to book covers or advertising posters. Stepanova’s contemporaries remember her as being in Rodchenko’s shadow, but her presence in that shared space was necessary. She provided support and was the first person to see what came out of the studio: paintings, drawings, objects and photographs. The School of Constructivism. This section examines Alexander Rodchenko’s extensive teaching activity. In 1920 he began to lecture at VKhUTEMAS. Supervised by Rodchenko, students created design degree projects such as a bus station, a sledge-train for poor roads, universal exhibition equipment and a mobile cinema and reading room. Works by students Anastasiya Akhtyrko and Zakhar Bykov enable us to see the method of instruction: from simple to complex, from thinking in two dimensions to three. In the 1960s Zakhar Bykov used Rodchenko’s lessons as the basis for teaching design at the Stroganov Institute. Paris, 1925. Here we see Rodchenko and Stepanova’s participation in the International Exposition of Modern Industrial and Decorative Arts, which took place in Paris in 1925. The Soviet Pavilion featured Rodchenko’s posters and theatre designs. Visitors were particularly impressed with Rodchenko’s agitprop works on paper – bright, witty advertising posters.One of the main exhibits in the pavilion was Rodchenko’s interior for a Workers’ Club. It was planned as a multi-functional space in which the simplicity of form reflected the new aesthetic ideals. Varvara Stepanova’s work was included in two sections of the pavilion: theatre and textiles. In the theatre section she showed set and costume designs for the play “The Death of Tarelkin”. Mayakovsky and LEF. This part of the exhibition looks at Alexander Rodchenko’s work with the journal Left Front of Art (LEF). Rodchenko and Stepanova’s work was connected with the journals LEF and Novy LEF, which were inspired by Vladimir Mayakovsky. Rodchenko and Mayakovsky worked together closely between 1923 and 1925. 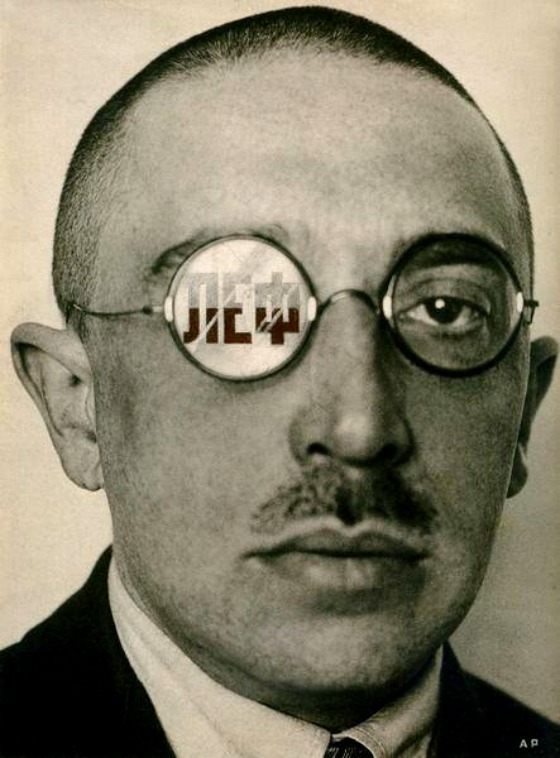 In that period Rodchenko produced the covers of every edition of the two journals, more than ten books by Mayakovsky, and the first editions of poems by Semyon Kirsanov, Nikolai Aseev and Petr Neznamov. He introduced the use of his signature poster style in the design of covers for both fiction and non-fiction publications. Rodchenko also produced the column “LEF Notebook” for Novy LEF, where he wrote about the VKhUTEMAS design school and published his first, experimental photographs. The two men began to work together as “Advertisement-Constructor: Mayakovsky-Rodchenko” and created the slogan “Nowhere else but Mosselprom”. In his design for Mayakovsky’s play “The Bedbug” Rodchenko developed the theme of “design for the future”. He created objects from the then distant year of 1979: fantastic machines, objects and costumes. Rodchenko’s people of the future were dressed in overalls and wore hats like pilots’ helmets. Photography. Here we see Rodchenko as the founder of the new photography. The exhibition includes vintage prints from the series “Moscow Yards”, “Student Campus in Lefortovo” and “Circus”; 1930s photographs of demonstrations and sport parades on Red Square; and objects from his studio, on loan from the artist’s family. Rodchenko began to take photographs in 1924. He photographed people deep in thought, living with the ideals of the future. A photo shoot at his studio was unlike an ordinary studio session. It was hard work for both the photographer and the model. In 1924 he shot a portrait of his mother. We see an elderly woman reading a magazine. Rodchenko expertly portrays the effort and internal strength of his subject. Olga Evdokimovna only learnt to read in old age. Mayakovksy posed for Rodchenko in 1924. The series of six portraits is done sparingly, without any tricks. From around 1925 Rodchenko began to experiment. Most of his shots were of buildings photographed from unusual angles. He considered “the series of cityscapes taken from above or at an angle” among his most important works. Rodchenko’s documentary photography was packed with information and always very varied. Photography became a continuation of the compositional experiments he had begun in painting. Rodchenko had a serious and thorough approach to photography. He cropped and mounted his prints, experimented with processing and format, and hand painted images, turning them in to works of art. Avant-Garde Exhibitions. Exhibition as Manifesto. This part of the display covers the artists’ participation in exhibitions of the Russian avant-garde, including the famous 1921 exhibition “5 x 5 = 25”. At each successive exhibition Rodchenko demonstrated the results of his latest artistic experiments. He believed that the sum total of these painterly “tests” would create an integral work. At the “Store” exhibition (1916) Rodchenko showed his cubo-futurist painting “Dance” and a series of line and compass drawings. Rodchenko’s first solo exhibition took place in May 1918 and featured compositions with planes. He could construct spaces of any length and depth by layering flat elements on top of each other. In the future Rodchenko would model similar structures but as spatial constructions rather than on canvas or on paper. In the same year he “patented” the circle and the principle of luminescence as separate themes in abstract painting. The following year he introduced the idea of the line as an independent form, the basis of compositional plans, frameworks and constructions. Varvara Stepanova took part in the 10th State Exhibition “Non-Objective Creativity and Suprematism” in 1919. Her bold, dynamic compositions of letters might today be considered closer to the genre of visual poetry. In the exhibition catalogue Stepanova called her attempt to bring together the emotional perception of sound and letter “colour-painted drawing”. At the 19th State Exhibition in 1920 Rodchenko and Stepanova had virtually a whole room to themselves. A number of machine-printed leaflets with the text of the article “Everything is experiment” were attached to the wall underneath paintings from the “Lineism” series. The artists aimed to show that people perform experiments throughout their lives, and that our life is an experiment for future generations. In 1921 five artists – Alexander Vesnin, Lyubov Popova, Alexander Rodchenko, Varvara Stepanova and Alexandre Exter – exhibited five works each in the building of the All-Russia Union of Poets on Tverskaya Street in Moscow. The name of the exhibition was an equation: “5 x 5 = 25”. It was intended as the conclusion of non-objective painting the beginning of the move to design, with sketches for textiles, samples of clothing, examples of printed materials. Stepanova showed works from the “Figures” series and these also featured in the catalogue. Also in 1921 Rodchenko made a series of engravings from geometric forms which he called “drafts”. The series showed that he had exchanged a purely artistic approach for one based on the logic of geometric construction in which there is no place for an accidental decision founded on taste. Formulae of the Avant-Garde. Analysis of Form. This section is dedicated to Rodchenko’s experiments with geometric forms and planes. He “tested” his inventions using drawing, painting, spatial constructions, design and architecture. Rodchenko created his first series of spatial constructions, “Folding and Disassembling” from interlocking pieces of cardboard. The effect of space was achieved through the arrangement of planes, inscriptions, arrows and exclamation marks in several layers. The second series of spatial constructions was made from the flat, concentric contours of a group of geometric forms. One of the artist’s names for this series is “Planes Reflecting Light”. The series comprised six works: two with concentric circles and four other using ellipses, hexagons, triangles and squares. The first person to draw attention to the combinative nature of these works was the artist, architect, designer and inventor Vyacheslav Koleichuk, who noted the combination of natural and free constructions. The circle is one of the central forms in Rodchenko’s abstract compositions, projects, constructions and even in his photographs. The circle in the 1918 series of sketches “Concentration of Colour and Form” embodied the idea of luminescence. The circle represented the eternal engine in Rodchenko’s 1922 designs for a porcelain tea service. A structure composed of linear circles created a vibrating surface on sketches for textile designs. The line was Rodchenko’s main graphic element. It contained the idea of movement, a path, a trajectory. It was a border, an edge, the breaking down of form, the trace of a technological operation – of a cut, a bend, a break. In the third series of spatial constructions, made of wood of uniform size and shape, Rodchenko used the laws of symmetry. His compositions grew like crystals, simultaneously in every direction. 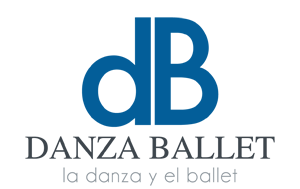 Constructivism is a project view of the world and of activity, a rational relationship to any task. It is the creation of helper-objects, the transformation of the object in line with requirements. Stepanova. Biomechanics. Here we see paintings, drawings and applied art which reflect the theme of the game, of combination, and the geometric stylisation of the human figure and elements of composition. Stepanova’s original style, which is known as “biomechanics”, is shown throughout its development. In 1919 Varvara Stepanova began to draw running, jumping and playing figures. The first painting in this series was called “Person with a Tambourine”. The figure appeared to be made from children’s building blocks. On canvas the artist created an abstract, universal human figure, like a logically arranged mechanism. It was reminiscent of meccano, as were the cardboard puppets made by Stepanova in 1926 for the photographic illustrations for Sergei Tretyakov’s book of children’s poems, “Self-animals”. The head was indicated by a circle with slits, the torso by a cylinder, the hands and feet by rectangular scraps of cardboard. All of the forms originated from the plane, just like the elements which formed figures in Stepanova’s paintings. In 1921 her painting became constructivist. The figures began to look like complex technical devices and mechanisms. By 1921 the question of construction was of more importance to the artists. Stepanova no longer simply looked for an anatomical basis for her schematics, but attempted to use the line to express the structural laws of construction of the head, torso and figure as a whole. At the “5 x 5 = 25” exhibition Stepanova, along with Rodchenko and the other artists, announced her move from easel painting to utilitarian creativity. The words “construction”, “production”, “engineering”, “equipment”, “thing” became more commonly used. In 1921 Stepanova gave a lecture about constructivism, proposing a new interpretation of artistic creativity as intellectual production. In the early 1920s the concept of constructivism intersected with the new direction in theatre. In its quest for new forms and means of expression, theatre settled on fundamental principles which were close to constructivism. The Meyerhold Theatre production of Alexander Sukhovo-Kobylin’s “Death of Tarelkin” continued the constructivist line. The costume designs were based on a single modular grid. For each character Stepanova found a particular combination of geometric elements and dark and lighter details. She depicted herself in Brandakhlistova’s costume, a long striped skirt and a blouse with a dark collar. This self-portrait represented a new type of artist, one who made projects rather than drawings, a constructor of things, equipment, clothing. In 1923 Stepanova designed another play. Her production of “Through Red and White Glasses” was brought to life by students of the Academy of Social Education. The set was the framework of a pyramid which was both a staircase, a lighthouse and a place for slogans. The “Reds” and “Whites” were created using a single style – “The Bourgeois”, “The Soldier” and “The Lady” were in white, “The Constructor” and “The Worker” in red. In the same year theatrical costumes began to be made in the style of “production clothing”. 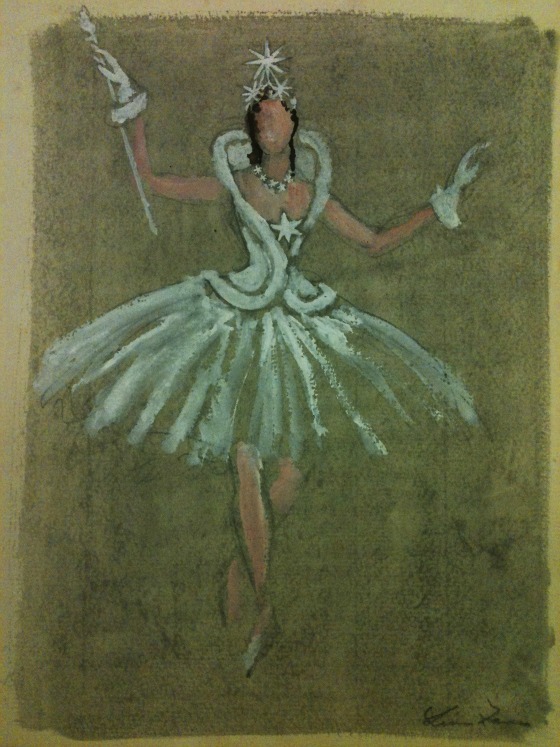 Stepanova wrote an article for LEF called “Today’s costume is production clothing”. An infinite field of activity opened up for the constructivists: clothing for train drivers, fire fighters, pilots and for sport. In 1923 Varvara Stepanova and Lyubov Popova started work as textile designers at the First Calico Factory. Circus. Acrobats and Clowns Cannot be Realists. This part of the exhibition includes paintings, works on paper, Rodchenko’s photographs of the circus and on the theme of football, plus late abstract compositions. Rodchenko admired the freedom of expression in circus performance. In the 1920s he made compositions of geometric forms soaring in a dark space. When photographing Moscow at that time he used the technique of shooting from high and low angles. The avant-garde and romanticism came together in the final stage of Rodchenko’s creative biography, in his works on the theme of the circus. From 1935 to 1948 Rodchenko worked on a series of paintings. It’s rare to find an entire circus ring or a circus audience in these works. As a rule they are multi-figured images of acrobats, jugglers, wrestlers and clowns. One of the first works in the series shows a rider jumping through a hoop. The brush strokes create the effect of luminescent mother-of-pearl and it is as if the figures do not absorb light but radiate it. Alexander Rodchenko first photographed the Moscow circus in 1928. The last negatives are dated 1944. Almost the entire series of 1940s photographs was shot with a Leica using a soft-focus Thambar lens, which created a smoky effect. Rodchenko the constructor is evident in the precision of the composition and the love for geometric form. Rodchenko the romantic can be seen in the incompleteness, the softness and the sadness. The most important work in the exhibition is Rodchenko’s 1921 triptych from the series “Smooth Boards”, about which he wrote in 1931, “I have taken painting to its logical conclusion and exhibited three canvases: red, blue and yellow. I affirmed: it’s over. Basic colours. Every plane is a plane and there is to be no representation. Every plane has a single colour to its very edges”. The Private Collections Department of the State Pushkin Museum of Fine Arts houses the Rodchenko and Stepanova bequest, donated in 1992 by Vera Rodchenko and Alexander Lavrentiev. It is the world’s largest collection of works by the artists, comprising more than 600 items and representing their main periods of creativity and the entire spectrum of their activity. 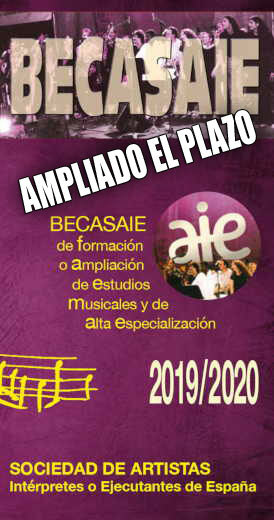 It includes paintings, drawings, prints, theatre designs, advertising posters, industrial design, collages, photographs and spatial constructions. Curators: Alla Lukanova, Deputy Director, Private Collections Department, State Pushkin Museum of Fine Arts. Alexander Lavrentiev, Rodchenko and Stepanova Archive. Aleksei Savinov, Private Collections Department, State Pushkin Museum of Fine Arts.